The new ECB Series Surdry Continuous Sterilizers sets a technology landmark as a genuine breakthrough in the industry of foods preserved by heating after packaging, for their flexibility to accept easily and quickly any package shape, size or material, including rigid metal or glass cans and pouches or thermoformed films. I agree with the legal policy Accedo al almacenamiento y gestión de mis datos por parte de esta web. The system, recently patented internationally by Surdry, features a highly innovative technique to insulate different thermal zones, which allow to divide the process in a sequence of steps for ramped pasteurization (<100ºC) or sterilization process (100ºC-140ºC), followed by one or more rapid cooling steps under programmable pressure up to 4 bar in the same tunnel. The robotic loading and unloading systems are designed to accept different containers, even without change of the picking head when the diversity permits it. 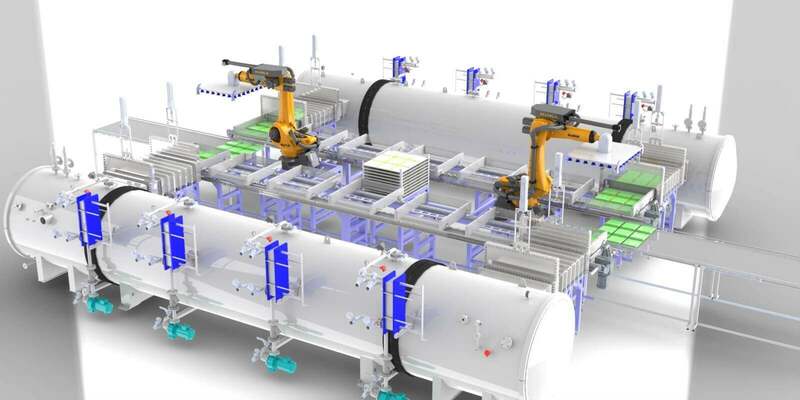 Each mini-batch of containers is loaded into a tray and then fed into the pressurized tunnel at speeds ranging 1-4 minutes depending on the batch size. The short loading time eliminates the quality loss associated to long waiting time of conventional batch retorts. Likewise, the heat loss reduction for quick loading contributes to a shorter thermal process. The dramatic economy generated by the steam and water savings results in a very quick return of the investment.